Submitted by Jason Horton on Mar. 18, 2018. Originally published on Dec. 19, 2015 and last updated on Mar. 19, 2018. This is the 2018 major revision of our keyboard stand buying guide. This guide focuses on stands primarily designed for 49 key instruments and up - if you need a stand for a smaller keyboard then carefully check the minimum width a stand or its tiers can be adjusted to, or consider getting a music laptop stand or an attachment for a larger stand. To make your selection process easier, we've broken the list into separate sections below for single, double, and triple tier stands. These can be used in either standing or sitting positions, although the table-top variety suit a wider range of player's height when sitting - you want your feet to comfortably reach your pedals while the keyboard isn't too high. We have not included the kinds of stands best suited to home organs as these types of stands and benches are primarily intended for stationary use, and are often specific to particular keyboard models, while we are focusing here more on multi purpose stands. 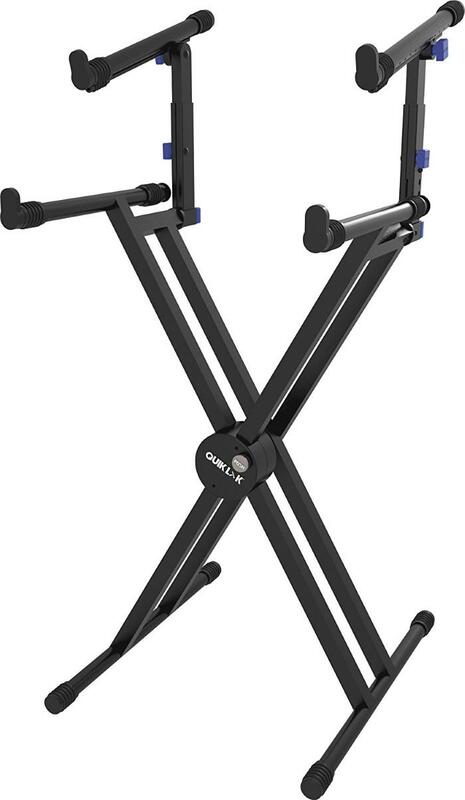 These are light-weight stands best suited for uses at home on in a studio context rather than for regular gigging unless you have a lightweight keyboard. They can also be problematic for use in a sitting position if you have long legs. 84 out of 100. Incorporating 300+ ratings and reviews. Although this stand retained its spot as the highest rated stand in it's class, it was very nearly beaten out for the second year in a row by the On-Stage KS7190 which has wider distribution and is also worth taking a look at. The World Tour SXKS Single is a basic stand suited to those on a budget and who don't need a more solid stand because it will mainly be used in a static setting at home or in the studio as opposed to being regularly thrown in the back of the van to take to gigs or rehearsals. It can accommodate keyboards from 49 to 88 keys and the range of height adjustment allows most people to play either sitting or standing. Note that X style stands can get in the way of your knees if you're tall and prefer to play sitting down. Height: Adjustable from 25.25" to 38.75"
It received many positive reviews from people who just wanted something for home or studio use, or for their children who were learning keyboards. It was regarded as being reasonably well constructed for its low price by many reviewers. Some people pointed out that many 49-key keyboards are not wide enough to use with this stand in the sitting position. There were many people who complained that the assembly instructions were not very good. Some of the experienced musicians who reviewed it said it was definitely not suitable for gigging. Some people reported it was wobbly even though some said it was stable - it may be that there are variations in quality which can happen with low-cost products like this. If you only need something for light duties and want to save a few dollars, then this is worth looking at. 83 out of 100. Incorporating 900+ ratings and reviews. 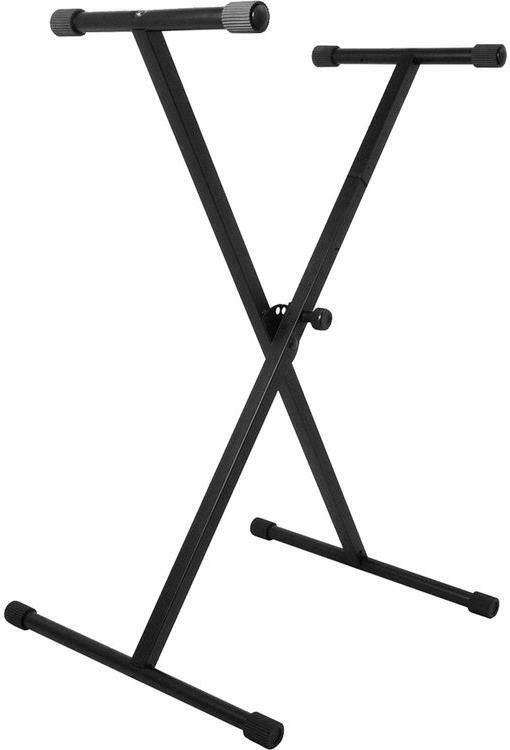 The On-Stage KS7190 is a simple single X keyboard stand. Like the World Tour SXKS above it is best suited to use at home or in the rehearsal room as opposed to regularly gigging. It works well with keyboards from 49 to 88 keys and being able to reduce to 11" in width at it's highest setting, it will also hold some 25 key instruments. Height: Adjustable from 27" to 38"
Most reviewers who mentioned stability said it had no problems in that regard, however it must be noted that most of those people were talking about home use rather than gigging. The ease with which the height can be adjusted garnered quite a few positive comments. A number of people have complained about the petroleum odor of the rubber parts, something that is unfortunately common with cheaper keyboard stands. Although many have said it's easy to assemble once you take it out of the box, a significant minority did have trouble assembling it with some saying it took them over 20 minutes to put it together. On-Stage are one of the better known brands so you can't go too far wrong buying this if you just need a simple cheap stand for home use. 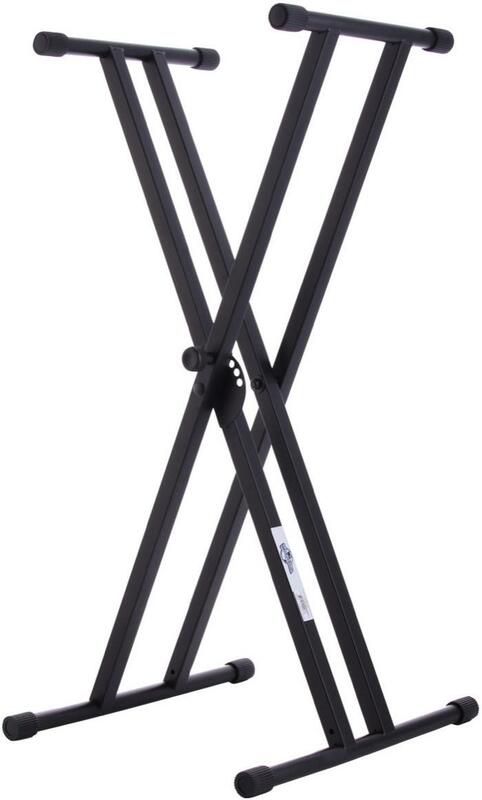 These have 2 sets of bracing tubes which makes them tougher and better suited to gigging, but even less suitable than single X stands for playing sitting down because many people's knees will bump into the cross bars. 91 out of 100. Incorporating 300+ ratings and reviews. This is a step up from the SXKS above. As you can see from the pictures the DXKS has an extra cross member making it significantly stronger. 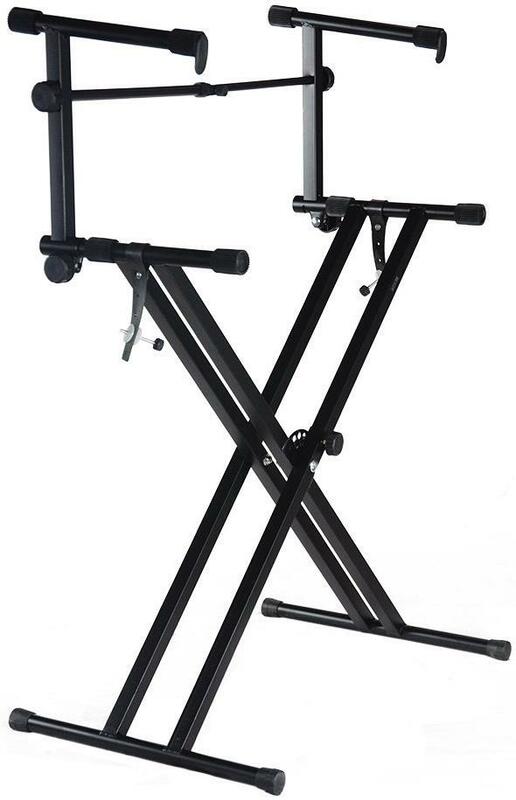 The World Tour DXKS is by far the most highly regarded single keyboard double-x stand. It can be used with keyboards with 49 to 88 keys in the standing position and 61 to 88 keys in the sitting position. Note that even in the sitting position it is still a few inches higher than a standard piano height. Positive reviews commonly said it was good value for the price. Many people said the Double-X configuration was more stable and sturdy than Single-X stands - this included many people who use it with full-sized 88-key keyboards. Several people complained of a chemical smell coming from the rubber feet. Many people mentioned that their knees didn't fit underneath in the sitting position - this is a common issue with X-Style stands. If you want a stand that is more sturdy than a Single-X stand, and you have a limited budget, then this is currently your best option. 88 out of 100. Incorporating 10+ ratings and reviews. Although the On-Stage Stands KS7291 is more expensive than the World Tour DXKS, it can hold 70 lbs more which is why some people are prepared to pay extra for the added security - something to consider if you're going to place expensive keyboards on it. It will accommodate keyboards with 49 keys and up. Width: base adjustable from 12" to 32"
Stable/Sturdy or words to that effect came up in a majority of user reviews. Many appreciate its solid welded construction. Several people also mentioned that the height adjustment mechanism works quite well. Many of the positive reviews were by experienced keyboard players whyo have a lot of live gigging/touring experience. Although this is a little on the expensive side for a double X stand, there were no consistently reported negatives from users, not even any complaints about the price. If you do a lot of gigging then this is probably the best double X option for you. These are much better suited to playing in a sitting position, although some can extend high enough to play standing up. Konig and Meyer dominate this section so I've included their highest rated stand along with a cheaper option which is the highest rated table stand under $100. 95 out of 100. Incorporating 650+ ratings and reviews. K&M have an outstanding reputation for very high levels of customer satisfaction. The Omega has 4 Velcro tapes to guide cables and is engraved with a height scale. It can accommodate a large range of keyboard widths from 25-key to 88-key keyboards. It can also be converted to a 2 Tier stand with the addition of the K&M Stacker (Amazon link). Very well built and sturdy, or words to that effect, were common in customer reviews. The ease with which it can be adjusted also generated praise in many reviews. Several people said that this is the best stand they've ever used. There were no consistently reported negatives in reviews, however one person said their assembly instructions were written in German but they were still able to assemble it using the pictures. 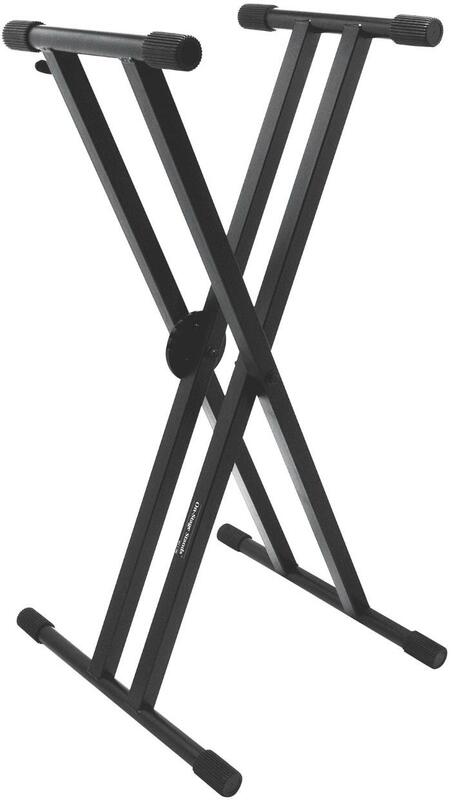 The overwhelming consensus of K&M Omega owners is that this is well and truly worth the higher cost with many saying it's the best keyboard stand they've ever owned. 90 out of 100. Incorporating 60+ ratings and reviews. 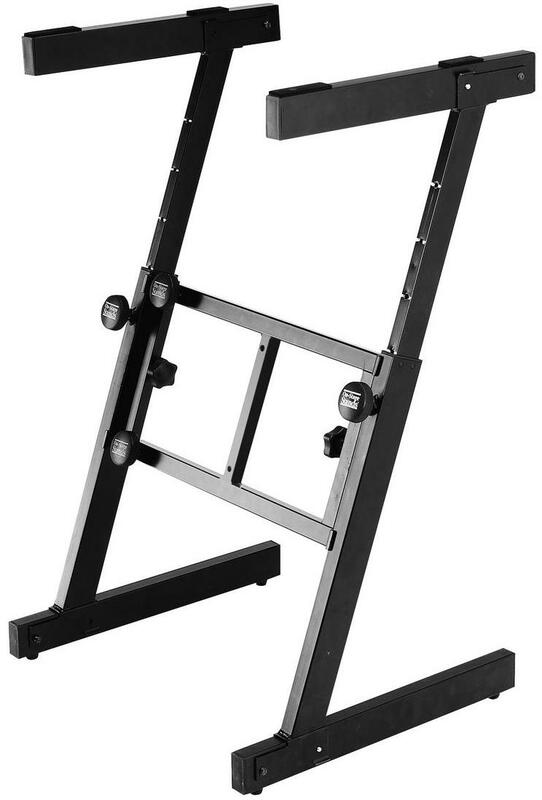 The WS8550 is the highest rated Table or T- style stand under $100 so I've included it here for anyone who's budget won't stretch far enough to get a K&M stand. It is suitable for most 49-key and larger keyboards. The 8 rubber pads (2 on each of the extended arms) can be adjusted to firmly hold a wide range of gear. With its variable width and depth it's also well suited to holding many DJ Coffins and Mixing Consoles. It has received many positive comments about its sturdiness, ability to hold keyboards and even mixing desks firmly in place, and how well it folds up for transport. A couple of people said that the stand is heavier than it needs to be but they were very much in the minority - other than that there were no consistently reported negatives. Our analysis of customer reviews revealed that this is a versatile stand which is quite well regarded by keyboardists and DJs. These tend to be more sturdy than X-Style stands and some can be raised and lowered to accommodate both sitting and standing positions. 96 out of 100. Incorporating 475+ ratings and reviews. This is an adjustable stand that can accommodate 49 key to 88 key keyboards and can be used in the sitting or standing position. The depth however is not adjustable - something that concerned a number of people who hadn't considered this before making their purchase. One other thing to note is that there are no 2nd tier extension accessories, so if you later want to add a 2nd tier you'll have to get a different stand. 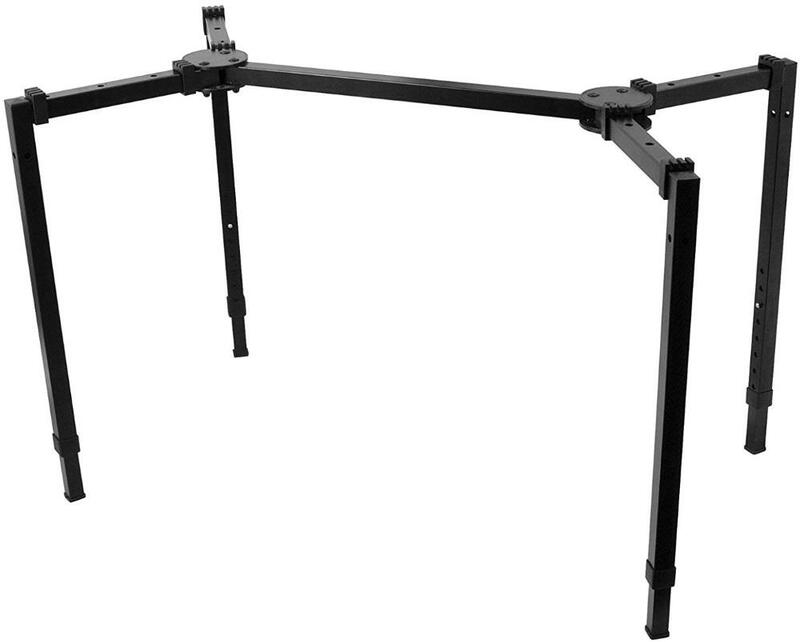 Height: Adjustable from 23" to 35.5"
Width: Adjustable from 23" to 40"
The most often cited feature in positive reviews is that this is a very solid and reliable stand. In fact that's the main feature that the majority of users talk about in positive (and even some negative) reviews. A few users complained about it not being easily portable saying that it remains bulky when you break it down for transport. Most of the small number of negative reviews talked about shipping issues rather than product quality issues. The most common issue in both positive and negative reviews was that it doesn't come with assembly instructions, but it's not too complicated and no one said they were unable to set it up. If you want a basic cheap but strong single keyboard Z stand, then consider buying this one. 92 out of 100. Incorporating 250+ ratings and reviews. The manufacturer says they've designed this stand for 55 key keyboards and up, however many 49 key keyboards will also fit - check your keyboard width and compare it to the specification below before buying it for a smaller keyboard. The On-Stage KS7350 has some features that gigging keyboardists will appreciate including the Center Box with independently adjustable widths allowing you get it level and with more sturdiness even if the surface your on is slightly uneven. It also breaks down into flat sections which makes it easy to transport. Height: adjustable from 24" to 38"
Width: adjustable from 21" to 36"
Many professional keyboardists attest to its suitability for regular gigging citing its reliability, sturdiness and ease of use particularly when it comes to setting up and breaking down at gigs. Many expensive and heavy keyboards including 88 key Nord and Kurzweil keyboards have been reported to work quite well without any stand wobble when played hard. A couple of people reported that it wasn't deep enough - make sure you check the specifications above if you have a deep keyboard. A few people complained that they didn't receive assembly instructions, and a few tall players said it wasn't as high as they would have liked. There were no other consistently reported negatives other than a few people with shipping issues. 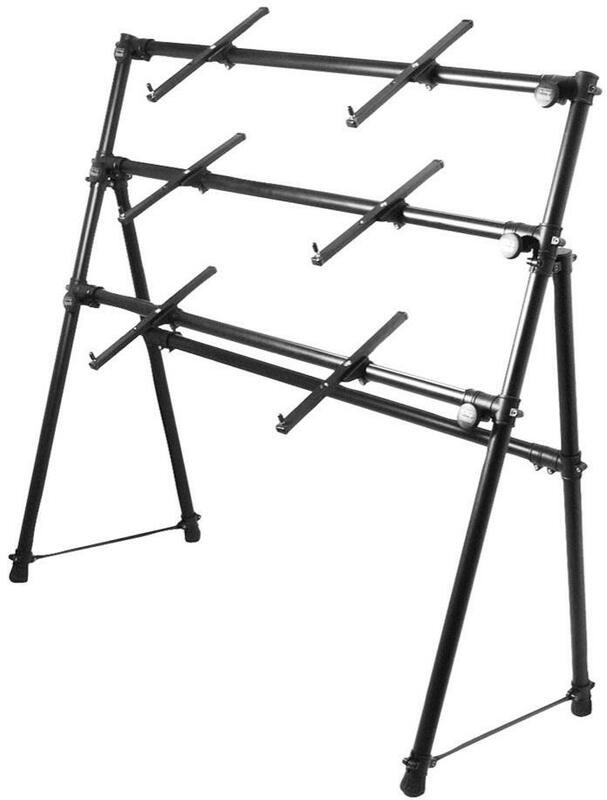 If you need a reliable single tier Z stand and will be transporting it to and from gigs, then this is your best option. One of the common themes we see in reviews for stands with 2 tiers or more is that some musicians aren't careful enough to prevent over-balancing the top levels by overloading them, or by removing a lower keyboard when one is sitting on top. These are Double X-Style stands with attachments to create an extra level. One thing that stood out in our survey data is that double keyboard x-style stands are consistently rated lower than their column or z-style counterparts, and based upon written reviews, that seemed to be primarily due to stability issues - the trade off is that these cost less than the other types. 83 out of 100. Incorporating 50+ ratings and reviews. The Quik-Lok QL-742 can accommodate keyboards as thin as 20" on the top tier if you adjust it to maximum height by positioning the feet in their closest position. Keyboard sizes from 49-Key and up will fit on the bottom tier in standing positions. Although the top tier has a fixed depth you can adjust it forwards and backwards to give you the right amount of accessibility on the bottom keyboard. It's point of difference with similar stands is that it has a "Push to adjust" locking disc system. Height - Main Tier: Adjustable to 3 heights - 26.4", 30.3", 34.3"
Positive reviews outnumbered negative reviews by roughly 3 to 1. Professional musicians were among those giving it positive reviews - some were happy using it for gigging and others happy with it in a studio context. Some people said that the push button did make height adjustment relatively easy. Other than shipping issues, there were several complaints about poor construction and/or low quality parts. These types of complaints were in the minority - one reviewer suggested there may be variability in quality control. There were mixed reports about how stable it was but despite the complaints, this is still the highest rated stand in its class. 79 out of 100. Incorporating 70+ ratings and reviews. This stand is reasonably popular due to it's low price and it can cope with keyboards from 49 keys and up. Height with both tiers: Adjustable from 36" to 48.5"
Height with bottom tier only:Adjustable from 29" to 40.75"
Width: Adjustable from 14.5" to 27.5"
The main positive feature is the very low price. There are a number of reports of instability and quality control issues - it seems the quality varies which is not entirely surprising at this price. We wouldn't recommend this for regular gigging, however if you will leave it static, at home or in the studio, then the low price makes it a reasonable choice. 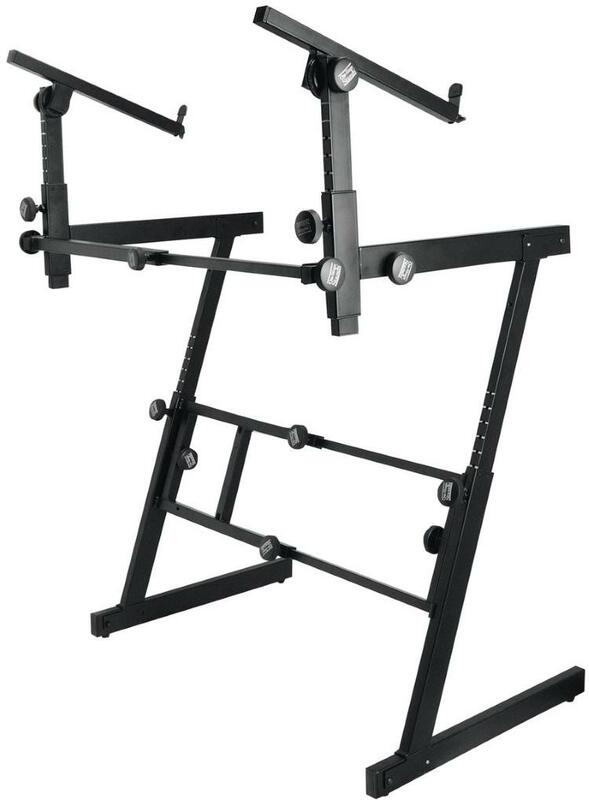 Although generally more expensive than x-style double stands, column stands typically get higher ratings. At the time of publication this was the highest rated column stand by a wide margin. The K&M 18860 has plenty of room for your knees and pedals when used in the sitting position and being adjustable up to 51.5" it is also suitable for playing standing up. It's a bit too wide for 25-Key keyboards but fine for 49-key or larger keyboards. Its strength and stability were consistently praised in reviews. Many people who play a lot of gigs were impressed with how easy they found setting up and breaking down for transport. The configuration of the legs which provides ample space for pedals was positively cited several times. A few people even praised how good it looks on stage. Accessories such as the laptop and iPad holders were also appreciated my many. There were no consistently reported problems with this stand. One person said their keyboard didn't fit the bottom support arms - that could have been avoided by reading the specifications before buying it. One person said it wasn't as sturdy as a double-x stand. One internationally touring keyboardist (who rated it 5/5) complained he wasn't able to get an off-the-shelf flight case for it instead of the K&M carry bag. Apart from the black version of the K&M 18860, no other column style stand comes close to getting the level of praise from professional keyboardists as this one does. 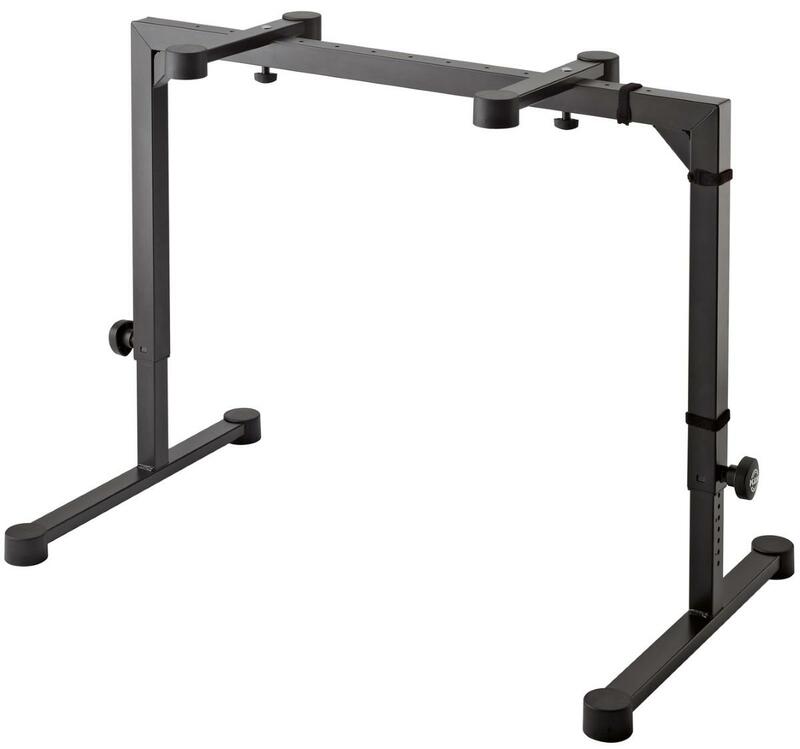 These typically have a higher load bearing capacity over column style stands - this is important not only if you use 2 heavy keyboards, but also if you want to add a lot of accessories such as laptop holders and microphone stands. 90 out of 100. Incorporating 350+ ratings and reviews. The KS7365EJ is designed to accommodate 55-Key to 88-Key keyboards. Some people put a plank of wood across one of the tiers to hold smaller items and so you could place smaller keyboards on it using this method, but this isn't part of the original design. Musicians have put it to use holding not only keyboards but also mixing consoles, DJ gear, xylophones and speakers. Sturdy, strong, and stable, or words to that effect, came up frequently in positive reviews - and even in a few critical reviews. Many said it was great for using with pedalboards/foot controllers. The vast majority of people who addressed the topic of stability while playing said it didn't sway or wobble. Its high load bearing capacity was also positively cited frequently in comments and discussions. Positive reviews came from not only keyboard players, but also DJs and percussionists (eg xylophonists). Some even report using one of the tiers to hold mixing desks to good effect. Some taller musicians report problems bumping their knees into the cross-bars when using it in the sitting position and it was pointed out that in this position the keyboard was a bit higher than a standard piano keyboard. A few people said that they would have liked more adjustment options from the range of height settings to the relative depth and widths and angles of the tiers. Some people who gig frequently complained about taking longer than they would have liked setting up and tearing down after shows, however those with large vehicles such as vans said it wasn't a problem for them (they report folding it up but not completely disassembling it). A small minority said they didn't think it was stable enough for them. 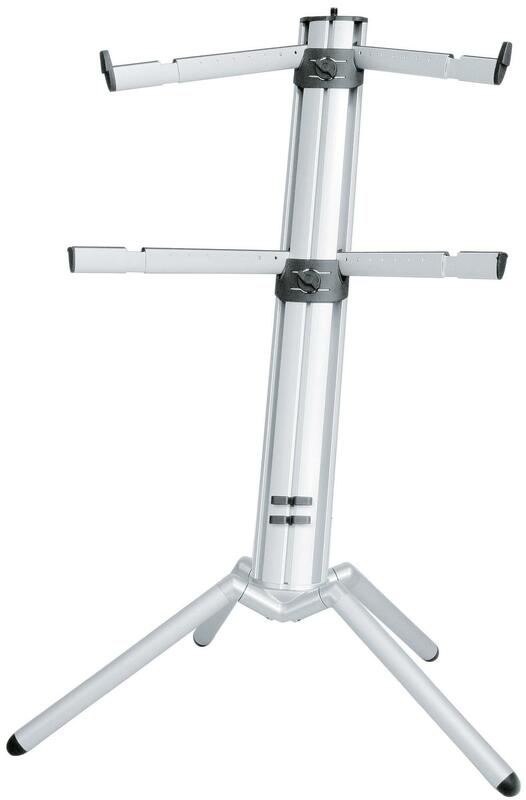 The KS7365EJ is a very highly rated and recommended 2 tier stand for both stationary and gigging uses. We found that in general, stands with 3 tiers or more receive lower ratings from customers than 2 tier stands do, and this holds true across nearly all review sources we found. It seems that this is a reflection of the additional complexity for setting up and pulling down and the fact that the more tiers you add the slightly less stable they become. Although 3 tier stands can come in other formats, we only found A-Frame style stands rated high enough to be included in this guide. 76 out of 100. Incorporating 150+ ratings and reviews. Although this isn't a particularly highly rated stand, it is a more cost-effective alternative for those who don't need their stand for gigging. The KS7903 base is 26” x 58" - this being the maximum amount of required floor space. It is designed to hold up to three 61-Key to 76-Key keyboards. Many keyboardists were happy using it in a static situation such as at home or in a studio. Its light weight was positively cited in many customer reviews. It was repeatedly described as sturdy if used only in a studio type setting. Many people said this wasn't appropriate for gigging due to the large amount of space it takes up both on stage and during transport. Several people complained that some of the plastic components were cheap and not particularly durable. Several people reported having their keyboards drop off due to failures, however others suggested that it was most likely due to incorrect assembly rather than failing parts. Based on customer reviews this stand should be fine for home or studio use so long as you don't need to move it frequently and your keyboards aren't too heavy. Strength. The heavier your keyboards are then the stronger your stands will need to be - don't skimp on budget or weight when it isn't worth the risk of having an expensive keyboard drop to the floor - make sure you check the weight specifications of a stand before you buy it. Also ensure your stand is rated for a greater load than the weight of your keyboard because it has to hold up under the combined forces of the keyboard weight and you playing on it. Size & Weight. There are two size issues to consider, yours and that of your keyboards. If you are a tall person and you play sitting down, some stands will have parts that get in the way of your legs or knees making it difficult to play and use your pedals easily. If you have a small keyboard, make sure the stand can adjust down to the width you need - you generally want the minimum width of your stand to be about 4" less than your keyboard width. Also make sure your stand, particularly 2nd or 3rd tiers, are rated to take the weight of the keyboard you want to place on it. Where will you be playing? If you're going to be regularly setting up and packing down then you need to look for ones that are easy to setup, tear down and transport. 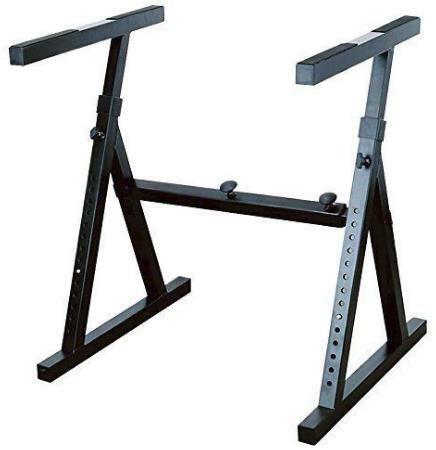 For example, four legged stands tend to be quite sturdy but at the cost of taking more time to set up and pull down. On the other hand if you mainly play at home then any sturdy stand will do the job. Number of keyboards. When you have more than 1 keyboard you're either going to need a multi-tier stand or multiple stands. If you prefer to have all your keyboards in front of you then go with a multi tier option, otherwise you can use multiple stands placed approximately at right angles to each other - sometimes referred to as an 'L' configuration. Accessories. Many keyboard stands have optional accessories for holding things like laptops, tablets, microphones and additional tiers. If you plan to use these you will need to take the combined weight of accessories and the items they hold into account when choosing your stand. Center of gravity. With multi-tier stands you have to be careful about which keyboards you place on each level to ensure the center of gravity remains as close as possible to the center of the stand. Generally, this means placing the lighter keyboards on the higher tiers. Different kinds of stands. The main types of stands are Single X, Double X, Column, Table or T Style, Z Style and A-Frame. The lighter X types are generally cheaper but less stable that the other types - the pros and cons of each type are described in each section below..
For further information about our methods see How Gearank Works. Submitted by Brett (not verified) on Feb. 4, 2016. The QL-723 needs to be on the list for three-tier stands. Thanks for the tip Brett. Submitted by Jason Horton on Feb. 7, 2016. I've had a look around and most retailers don't sell it - in fact I only found 4 reviews which isn't enough for it to have a Gearank score, so we won't be able to include it unless more shops sell it. Submitted by Johnny C (not verified) on May. 31, 2016. I own the QL-723. I've had issues with this stand after maybe 6 times out on gigs. First, the screws on the "X" part of the stand or the base that holds up the 2nd tier could not tighten very well thus causing the 2nd and 3rd tiers to be shakey. I eventually stripped out the screws and the receiver nut inside the frame on a gig. Fortunately for me, there was a Home Depot close by so I was able to purchase threaded rods and slipped them through the receiver and put wingnuts at both ends so that I could keep the 2nd tier stable. Speaking of the 2nd tier, the screws holding up the arms have stripped out as well which won't stop the keyboard on the second tier from falling onto the keyboard on the first tier. I have three phone calls and an email into QuikLok to inquire about replacement parts but their customer service department has yet to call me back. 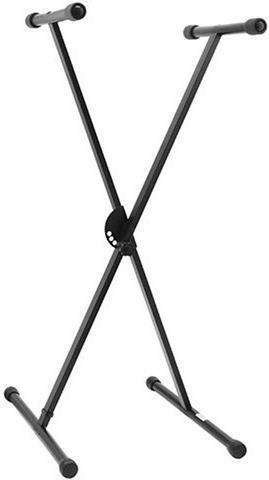 Would I buy another one of these stands or recommend them? Probably not unless they come up with a better design to prevent the screws from stripping out. Thanks for the advice Johnny! Submitted by Jason Horton on May. 31, 2016. Submitted by Nopeynope (not verified) on Aug. 28, 2016. Is that design the same as on the 623, so they will have the same issue? Submitted by Jason Horton on Jan. 31, 2017. Just letting everyone know that the QL-723 has been included in the finalist list of stands that we are evaluating for our upcoming 2017 update of this guide. Submitted by Stephen Pate (not verified) on Dec. 19, 2016. Thanks for the tip Stephen. Submitted by Jason Horton on Dec. 19, 2016. Thanks for the tip Stephen. We didn't accidentally 'miss' Jaspers, we deliberately only included brands that were widely available from US retailers at the time. If they become widely available in the USA then we will include them in our product research when we next update this guide. Submitted by Ike (not verified) on Mar. 19, 2018. Where can I get a stand with the second tier adjustable down to two to three inches above my main keyboard. These second and third tiers are really for show, in bands. I do a single act. Need the other keyboard right above the main. If I could put another keyboard on the main it would be perfect. But as you know with all the buttons etc it is not possible. I play a Motif XF7. Help. Submitted by joe (not verified) on May. 4, 2018. Submitted by Mike (not verified) on May. 10, 2018. Yes. Definitely the K&M Spider Pro. I own one and love it. Only wish they made a 3 tier. However, you can buy a 3rd arm and add it in. It's a little tight for me but if you want your keyboards stacked tightly together, the K&M is your stand. Well-made, German engineered. A little pricey but well worth it. Submitted by Kristian (not verified) on Nov. 25, 2018. Have you looked at the Rockville RKS30X Double X? Was considering for my P-115.